"If these goofy Miami garage punks ever come to your town, be there with beer money. After a 2009 album, assorted seven-inch singles, and a recent live recording for Jack White's Third Man imprint, Jacuzzi Boys have taken their place among the best sloppy racket-makers bashing out easy-boogie soundtracks to your next drunken night at the local rock dive..."
While definitely within the garage milieu, there's definitely more going on here with this Miami trio. Jacuzzi Boys sound is less blown-out sounding than most of their brethren, with a strong post-VU New York vibe with them -- Television and The Feelies are pretty obvious influences here I think -- and their album from last year, No Seasons, is pretty damn great. DJing between the bands we've got the world famous Gemma K-Tep. Bruise Cruise Pt.1 Feat. 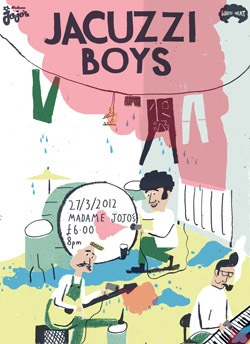 Jacuzzi Boys from Bayan Joonam on Vimeo.